Every month, Fulbridge interviews a Fulbrighter from around the world to get a glimpse of what life is like in different placements. This month, Lisa Gagnon, a 2017-2018 ETA in Latvia, talked with Alina Clay, the 2017-2018 researcher in Latvia. Why did you choose Latvia? 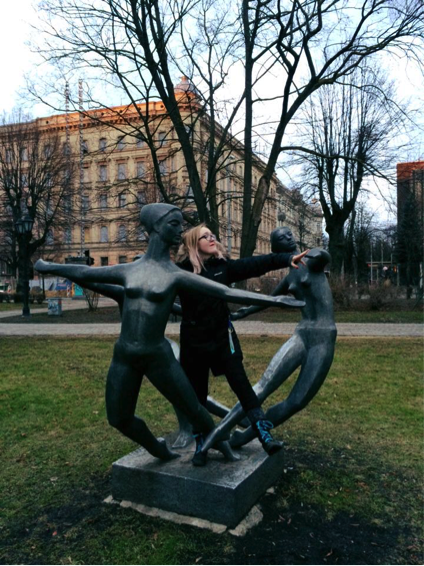 I was initially introduced to the Baltic States when I chose to study abroad for my junior year of college at the University of Tartu in Tartu, Estonia. During that year, I had the opportunity to travel to a few cities across Latvia and immediately fell in love with the diverse cultural traditions, history, inhabitants, and Latvian language. I knew that once I graduated, I had to find a way to return to Latvia and enrich my understanding and knowledge of the people, history, and cultures there. Alina enjoys her first visit to Riga, Latvia two years ago. Where are you located and what organization are you affiliated with? Living in Latvia’s capital city of Riga, I am affiliated with a political think tank called the Latvian Institute of International Affairs. I chose this institution because of the regularity with which they publish research in English and hold high-level events and meetings with scholars and practitioners across Europe. I chose this institution after having the opportunity to return to and live in Riga the summer before submitting my Fulbright application, thanks to a special student grant offered by my alma mater’s Office of National Scholarships and Fellowships. As a result, I was able to interview the Director and many of the scholars at this institute and realized that my research interests and goals matched well with theirs. What is your research project/topic? 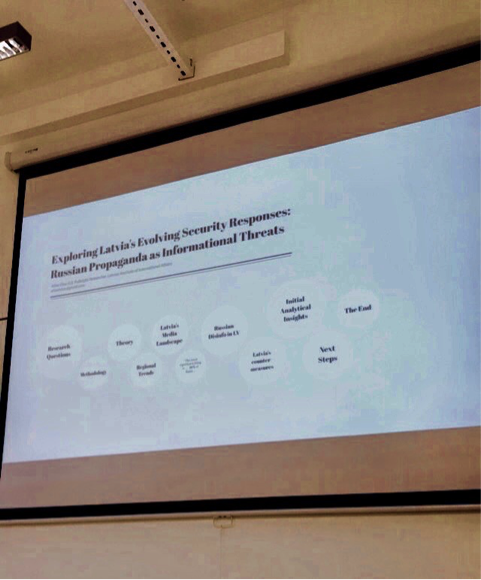 In a broad sense, I research the range of Latvian responses to information threats (think “fake news”) present in the country’s media and political spheres. More specifically, my research has been guided by several overarching objectives, including providing innovative insights into contemporary information security challenges in Latvia and applying traditional theories of discourse and power to critically examine Latvia’s progress and remaining challenges. Thanks to the support and guidance from key scholars here, including my research advisor Diāna Potjomkina, I have been given numerous opportunities to explore and advance my research interests during my Fulbright experience. This year has included conducting interviews, site visits, and group discussions, as well as engaging in community outreach, all of which have substantiated and complemented my research findings. Living in Riga has been the ideal location to easily access resources, contact and meet with experts in my field, and present at various seminars and conferences. Because of the academic opportunities that abound in the city, I have developed a much deeper and holistic understanding of contemporary information threats in the country (and region more broadly) and responses to effectively counter them. A slide from Alina’s Fulbright research presentation from the 2017 Academica Conference in Tartu, Estonia. What does a normal work week look like for you? In my eyes, the beauty of the Fulbright program structure for researchers especially is that there is no normal work week for us. Each time that I tried early on to establish a routine in my week, there would always be an upcoming conference to present at, or a set of interviews to complete, or an in-depth site visit in another city to conduct, or a specific resource that took the entire day to access, all of which would thereby unravel any of my attempts to have a “normal” or routine work week. In that sense, I was able to learn (with time!) to roll with the punches so to speak and enjoy the spontaneity and flexibility that each week presented. 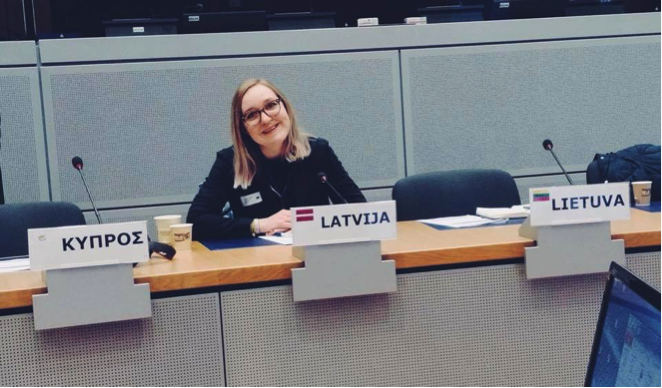 Pictured is Alina at the European Commission, which was part of the 2018 EU-NATO Seminar held by the Fulbright Commission in Brussels and which welcomed around 50 Fulbright grantees across Europe. How have you gotten involved in your community outside of your direct research project? From day one (and actually before my grant even started), I promised myself that community service and outreach would be a top priority during my Fulbright experience, both to complement my research interests and foster a much deeper and more nuanced understanding of Latvia. One year abroad is not that much time when you think about it, and I firmly believe that one of the most effective and quickest ways to truly learn about a country and its people is to serve in the local communities. During the fall of my grant period, I volunteered primarily with the NGO “European Movement – Latvia,” and had the opportunity to organize and run events that helped international students and foreigners to learn more about and acclimate to Latvia, as well as help to prepare policy recommendations on important EU-related topics. As spring rolled around, I began to volunteer with an education NGO called the “Education Development Center.” Supported by a grant that the NGO received from the U.S. Embassy, I spent the past several months traveling across Latvia and presenting self-designed master-classes on media literacy to high school students. Thanks to the incredibly hard and consistent work of the Education Development Center and the critical importance of spreading media literacy in Latvia today, my community outreach efforts garnered local attention and ultimately demonstrated the breadth of opportunities and platform that the Fulbright program provides each of us so that we can create – and further – positive change in our host country. 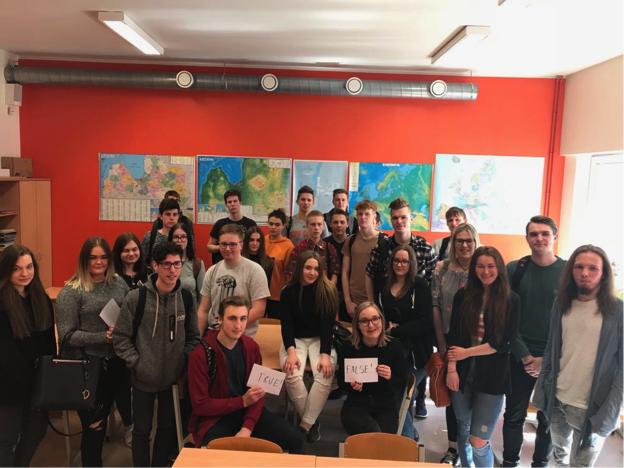 Volunteering alongside these two active NGOs, I have felt honored to learn so much from students, teachers, government actors, and education experts about life in Latvia, its education system, its role in the European Union, and more. 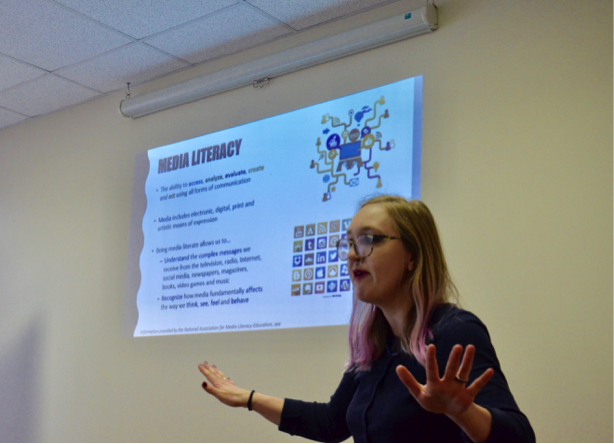 While volunteering with the Education Development Center, Alina visited Latvian public high schools to present self-designed master-classes on media literacy. What have been some challenges? While I could list a number of minute and almost comical challenges such as getting lost more often than not, misunderstanding the bus or tram schedule, and using my rudimentary Latvian language skills to get by in social situations, I think one especially relevant and constant challenge during my time as a Fulbright was recognizing – and accepting – that I cannot do everything. While the world is indeed our oyster during our Fulbright period, we are naturally to some degree constrained by time and our primary work responsibilities as either a researcher or ETA. I had to realize early on that I had to be very intentional about everything I did: the organizations I wanted to volunteer with, projects I wanted to contribute to, meetings I wanted to organize, and trips I wanted to take around the country. Many times, I felt that I had to be what I considered “the perfect Fulbright,” which in my mind meant accepting every opportunity – whether that be a project, meeting, contact, conference, or publication – that came my way, while simultaneously always seeking more. After some time, I recognized two things. One, that finding a balance to the fast-paced lifestyle of a Fulbright grantee was critical, and two, that no “perfect Fulbright” experience exists. The latter point embodies the beauty of the program, which allows us to mold our experience the way we want and expect it to be, and change aspects of it along the way as necessary. My Fulbright experience has been constantly fluid and adaptable, as well as unique – and this is the case for every Fulbright grantee’s time abroad. We should not feel undue pressure to fulfill some impossible standard of what a perfect Fulbright year is. Rather, we should be engaged and passionate about what we choose to do during our time, as well as surround ourselves with people in our host country who support us and help us to learn as much as possible. On a more general note, I would offer a small piece of advice, which is to remember that while any challenges you encounter during your Fulbright experience may be incredibly difficult to overcome or resolve, you always have an extensive Fulbright support network (both in your host country and around the world), your respective U.S. Embassy, and your family and friends back home, all of whom can help you to get through any rough patches. For me, one of the strongest support systems I had all year was with the other three Fulbright grantees in Latvia. From day one, we made sure to be there for one another, offer a listening ear, seek advice from one another, share the highs and lows of our weeks, and take frequent trips together, all of which ensured that no one ever felt truly alone or lost during their Fulbright experience. 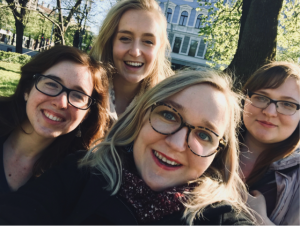 Alina and the three Latvia ETAs gather in Riga for a reunion, highlighting their year-long friendship and support system. Any advice to prospective Fulbright researchers applying to Latvia? First and foremost, I recommend prospective researchers to be intentional when choosing your institutional affiliation. Whether it be a university, think tank, nonprofit organization, or another type of institution, you should be able to present them early on a clear and concise research proposal and list of research goals. Just as you should understand for yourself why you are choosing a particular institution over another, the respective institution should also understand what you can bring to the table and do to enhance the academic environment. Furthermore, as is the case in most places, people at Latvian universities, think tanks, and NGOs are extremely busy, often traveling, etc. Therefore, expect to be given a lot of independence and flexibility with your work week and time frame for research deliverables and publications. If you receive the Fulbright research grant to Latvia, I would recommend identifying early on specific research outputs that you could accomplish each month that you are in Latvia, so that you use your time wisely and efficiently. Furthermore, a clear timeline of your research experience will allow you to take advantage of additional opportunities that come your way, such as engaging in community service, presenting at conferences, or traveling. I firmly believe that the platform offered to us by the Fulbright program is one of the most effective ways – if not the most effective! – to exemplify diplomacy in action. That is, to foster genuine understanding and awareness between vastly different cultures. As Fulbright grantees, we have both a great responsibility and a great privilege to represent the United States and broaden (and hopefully, positively impact) others’ beliefs and impressions of Americans. I remembered this in my interactions with Latvians, many of which were the first time that they had met or talked with an American. In this sense, by taking seriously this role of a cultural ambassador and simultaneously opening your mind to the people and cultures around you, you will be able to enrich your Fulbright experience abroad multifold. Upon completing her Fulbright research grant this summer, Alina Clay will begin a Master of Science in Foreign Service at the Edmund A. Walsh School of Foreign Service at Georgetown University. She has spent several years working in nonprofits, policy centers, and academic centers both in the United States and abroad. With the support of the Pickering Foreign Affairs Fellowship, she will pursue a career in the Foreign Service upon completion of her Master’s degree. You can read her most recent publication from her Fulbright research here: http://liia.lv/en/analyses/assessing-the-significance-of-media-literacy-in-latvia-a-critical-tool-of-societal-resilience-687.